1. Sterilize canning jars and prepare two-piece canning lids according to manufacturer’s directions. 2. Sort and wash fully ripe peaches. Remove stems, skins, and pits. Finely chop or grind the peaches. Remove peel, white portion, and seeds from oranges. Finely chop or grind the pulp. 3. Measure the prepared fruit into a kettle. Add remaining ingredients and stir well. 4. Boil rapidly, stirring constantly, to 9 degrees F. above the boiling point of water, or until the mixture thickens. 5. Remove from heat; skim off any foam. 6. 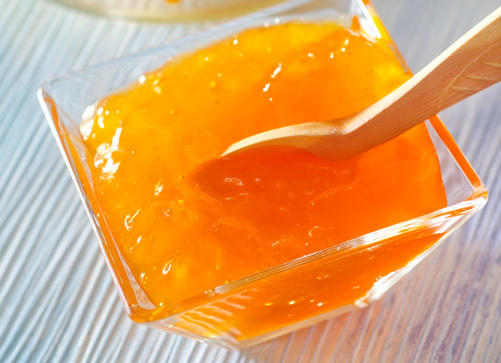 Fill hot marmalade immediately into hot, sterile jars, leaving ¼ inch headspace.